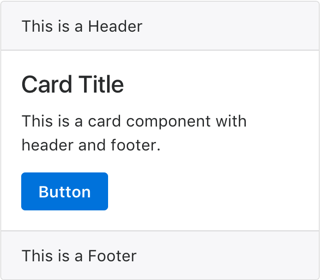 Bootstrap 4 has a new component called cards. 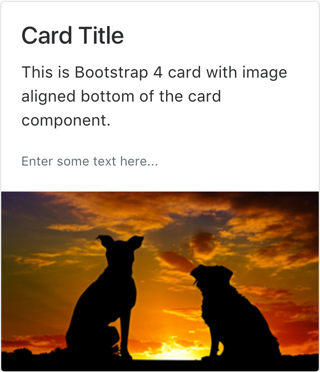 The components like panels, thumbnails and wells in Bootstrap 3 were removed and made as a single component called cards in Bootstrap 4. Cards are mobile friendly elements and became most popular with the use in Google Material Design. In this tutorial let us discuss how to create various cards in real-time. 1. What is Cards in Bootstrap 4? Cards are fluid container contains header, footer and content. The content part can have different type of elements like title, description, image, buttons, etc. With mix and match of different elements, there are lots of possibilities to create different types of cards. We cover cards with basic and most appealing look. 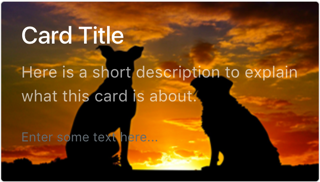 The basic card component will have an image, title, description and a button. This is the most generic form of using cards on blogs and page layout designs. Ideally there is no need of scripts for cards as long as only simple elements are used within card block. As you have noticed there are lot of CSS classes are used to create a card. The card should be identified with “.card” class wrapped with a <div> tag. The image is an optional element in the card. In order to include the image on top you should add a class “.card-img-top”. The additional class “.img- fluid” is added to ensure the image is responsive and fit into the container width. The card can have multiple card blocks wrapped inside a separate <div> tag with a CSS class “.card-body”. Each card block contains the content for that block like title, description, etc. In our example w have used <h4> heading for title with the class “.card-title”. After title we have short description using <p> tag with the class “.card- text”. Finally we have a button identified with normal Bootstrap button class. Remember the “.card” and “.card-body” are sufficient to have a card with any type of content inside the block. The card component by default is fluid and spread to the full width of the container. In the above basic card example, we have used “style=”width:20rem;”” to limit the width to 20rem. You can use different ways to restrict the width. Using inline style like in the above example. Using utility classes to adjust width and height. 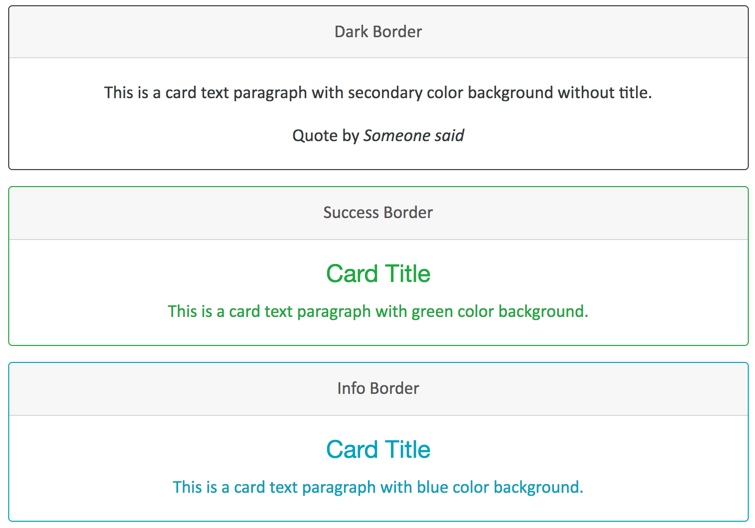 In all our examples, we will use inline style to make the card to a specific width. Let us start modifying the basic card to have a subtitle and links instead of button. 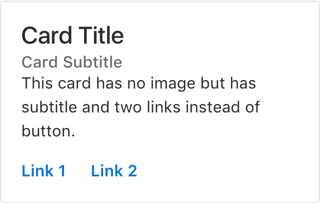 The subtitle can be added using “.card-subtitle” class and bottom margin is to be added to create required gap between title and subtitle. Links are create using standard HTML anchor tags. 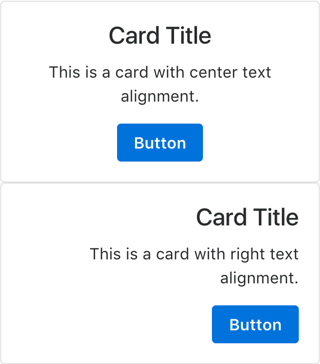 By default the card elements are aligned to left which can be changed to right and center using “.text-right” and “.text-center” classes respectively to the “.card-block” class. The image element is removed in the above card example to showcase the text alignment. The header part of the card can use default navigation component to convert the card like a horizontal tab like below. 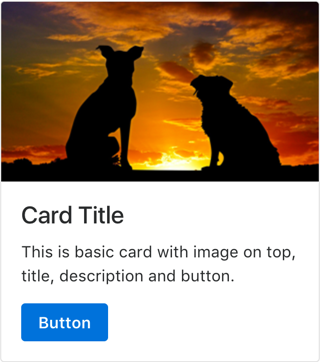 The default card will have the image on top of the card as shown in the basic card example. You can move the image down to the card using “.card-img-bottom” and move the <img> tag below the card block. The “.card-img-overlay” class is used within <div> tag which covers all text elements to overlay them on the image. Here we have used “.card-inverse” to convert the text to light color as we have used dark background image. You can read more about inverted card in the next example. By default the text elements of a card uses dark colors assuming the background color is of light color (generally white). The text color can be easily inverted into a light color using “.text-white” class. Remember this will only inverse the text colors and you should declare the background manually to a dark color using “.bg-dark” class in order to ensure the readability. Below is the code for inverted card with black background color declared using inline style. Looking at the cards with white background will be boring. 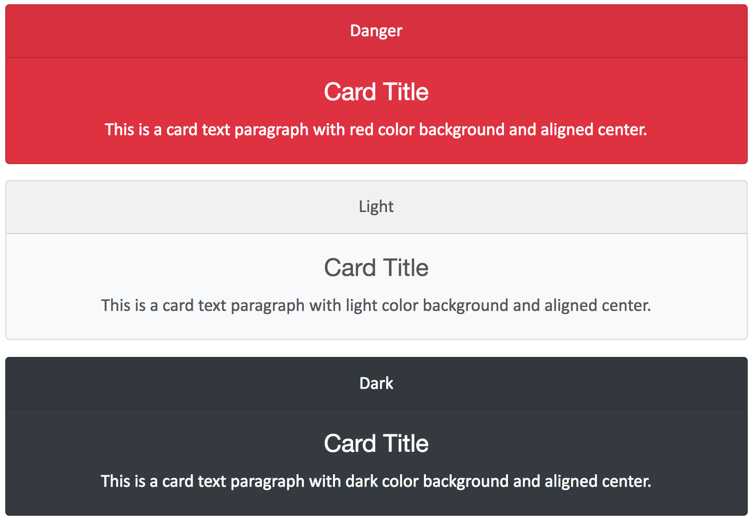 Use any of the background utility classes to add colorful background to the card component. You can change to one of the background colors like primary, secondary, success, light, dark, warning, info or danger. Below is the card with header and different background colors. 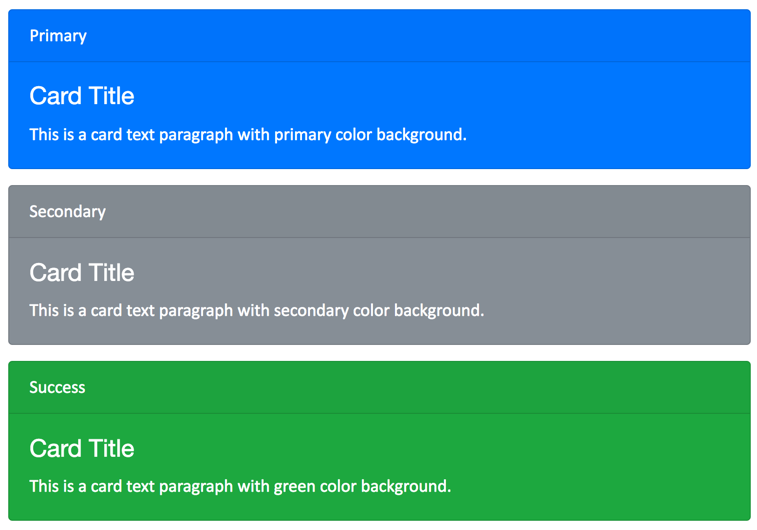 Remember to include “.text-white” class as all these backgrounds are darker color which needs the text to be in lighter color. The outline cards will have plain white background with different border colors using “.card-outline-primary“,”.card-outline-secondary“,”.card-outline-success“,”.card-outline-info“,”.card-outline-warning” and”.card-outline-danger” classes. All the above examples deal with creating card as a single component. 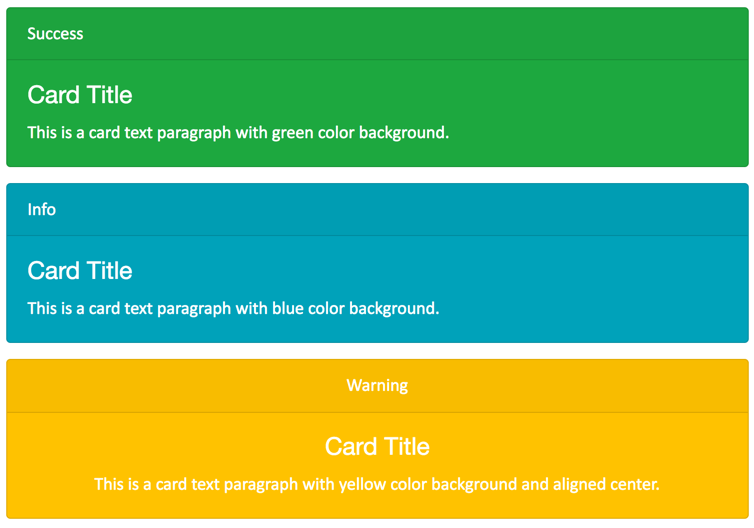 Bootstrap also offers three classes to create card layout which is more suitable for blog layouts. 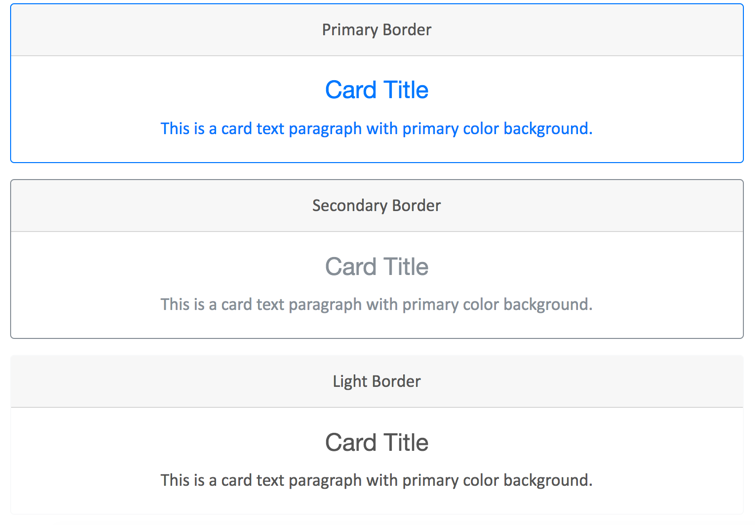 We will discuss these card layout classes in our next tutorial.